Ok, no Howlers here. This is a title I tend to forget, but 2000AD isn’t the only British comic celebrating a landmark occasion. DC Thomson’s doughty comic digest Commando is releasing its 5000th issue next week. 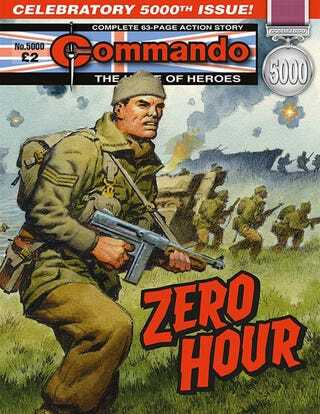 It sports a cover by Ian Kennedy, who has produced more covers for the magazine than any other artist, and an all-new story titled Zero Hour by writer Ferg Handley and artist Carlos Pino. Commando No 1 from July 1961 which will set you back at least a grand these days. Pocket sized Commando first hit UK newsagent’s counters in July 1961 (or at least those little wire racks they stick on the side). It has been telling tales of daring-do ever since. During the Eighties an issue would sell up to 800,000 copies. They might be carrying on with the good fight but current estimates peg it around 10,000. Issues are released four at a time, artwork is black and white with typeset captions and speech bubbles. Sound effects are used sparsely and each story has a beginning, middle and end. Despite the title, the action may take place at sea or in the air and while the First and Second World War are staple settings, the comic does venture into other arenas with Romans and the Napoleonic Wars providing backgrounds for adventure. I think they have even dabbled in space opera, though that was usually left to a sister title, Starblazer (which featured early work by Grant Morrison). Gosh, Commando used to be a shilling but now you need forty of them to buy a copy. That’s inflation for you. Buying back issues of Commando can be an expensive endevour but there are an assortment of chunky collections reprinting classic issues available through online retailers and remainder book stores.